Well, while I was away travelling, my wife’s greenhouse project out on our back deck (as posted about recently) has progressed very well. We aren’t going to be reaping any huge harvest by any means but we have some nice things coming up nicely and will be able to expand the operation next year. 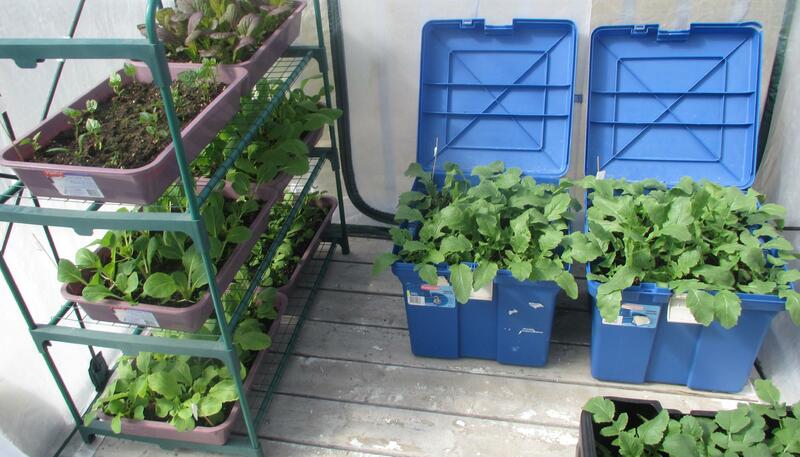 At the right, in the three deep boxes, we have Daikon growing. The box in front (only partially visible in this picture) is a different variety than the other two. On the shelves at the left, beginning at the top, we have something called ‘Bush Beans’ (they are not quite as vigorous as everything else as yet) and, behind, there is a variety of Japanese Mustard. My wife tells me I need to start using this fairly soon so as to ‘prune’ the growth. On the second shelf there is ‘Joi Choi’ at the front. I gather this is a variety of Bok Choy (白菜) and, I am not sure, but I think the name is Japanese. Behind it, we have ‘Komatsuna’ (definitely a Japanese name) and this is apparently also known as ‘Japanese Mustard Spinach). Finally, on the lower shelf, there is Swiss Chard in the foreground and Kale beside it. I am guessing that, eventually, they will have to go on the top shelf as they get quite tall. Man oh man..here in the temperate zone my garden isn’t doing half as well as yours! Your wife’s deck garden looks healthy, quite a collection she has assembled. The harvests are going to taste so delicious since they will be from the deck to the pot with no time loss between. Wow, your wife’s deck garden is doing terrific. I know you will both enjoy the fresh produce. Kudos! Looks like the greenhouse is coming along nicely. Did you keep the funny sign?